Linguine and clam sauce with asparagus. Before asparagus season ends, get your fill by adding it to your favorite dishes. Here’s an example of how easy it is, courtesy of Dole, which adds its fresh asparagus to the classic pasta dish, linguine with clam sauce. 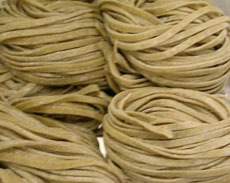 Consider using whole wheat linguine for fiber and flavor. If asparagus season has passed, add green beans or snow peas. This recipe makes 4 servings; prep time 10 minutes; cook time 25 minutes. 2. HEAT the oil in a large nonstick skillet over medium-high heat. Add the mushrooms, garlic, salt and pepper. Cook for 5 minutes until mushrooms begin to brown. 3. ADD the asparagus, carrots and two tablespoons of water. Toss to combine and cover skillet. Cook 4 minutes longer. 4. ADD the tomatoes and the clam juice. Cook uncovered 1 minute longer. If the pasta is not yet cooked, remove vegetables and clams from heat and cook pasta until it is al dente. 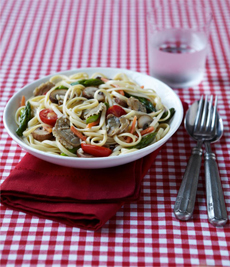 Use whole grain linguine for added fiber and flavor. Photo courtesy Pennsylvania Macaroni Company. 5. DRAIN pasta and add to the vegetable mixture along with the reserved clams. Raise heat to high and cook 2-3 minutes longer until pasta is thoroughly coated and most of the liquid is absorbed. Plate and serve. Do you know the difference between popular pasta cuts and shapes? Discover the different types of pasta in our delectable Pasta Glossary.